BRAND NEW!!! 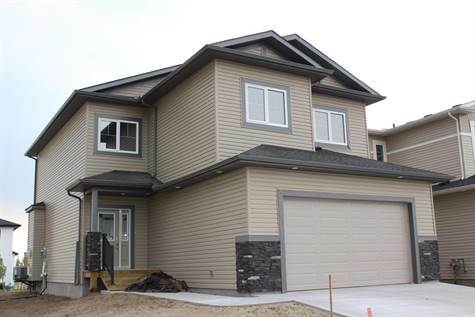 This 2260 sq ft 4 BEDROOM HOME is built within the wonderful community of Whitetail Crossing in Mundare, only 40 east of Sherwood Park. This impressive home features an open concept main floor with a large kitchen featuring dark cabinets and granite countertops, gas range, eating nook surrounded by windows and a wall mounted gas fireplace surrounded by stonework in the great room. The upper level offers 4 good sized bedrooms PLUS a bonus room! Luxurious ensuite in the master bedroom complete with a large shower, soaker tub and double sinks! The finishing of this home is sure to impress with neutral tones throughout, upgraded lighting, hardwood floors, central air conditioning and the list goes on. Enjoy the ability to walk out your door and drive your golfcart to the course. This wonderful Community has so much to offer, a brand new k-8 school, daycare, grocery store, curling and hockey rinks.